This rich tasting dish requires little actual work time. 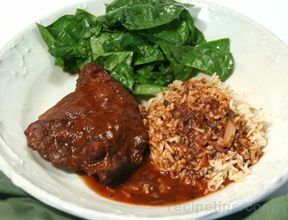 Using dark meat and leaving the skin on adds to the flavor and prevents drying out. If you prefer not to eat the skin, remove it after cooking. In a large skillet, heat oil. Generously salt and pepper chicken pieces and add to skillet, skin side down. Cook until well browned, about 10 minutes. While chicken browns, slice or chop garlic. Mix tomato paste into about 1/2 cup of the wine, stirring until smooth. Mix with remaining wine and pour over browned chicken. Add garlic and oregano. Adjust heat to maintain a simmer and, with lid slightly ajar to allow evaporation, cook 30 - 45 minutes, or until chicken is very tender. Remove chicken and keep warm. Raise heat under skillet and boil sauce to reduce it to a thick gravy, or to desired consistency. Taste for seasoning. Remove oregano if you used fresh whole sprigs. Remove and discard skin, or leave on, as preferred. Pour sauce over chicken and serve hot. Delicious served with something to soak up the juice, such as rice, potatoes, crusty bread, etc.